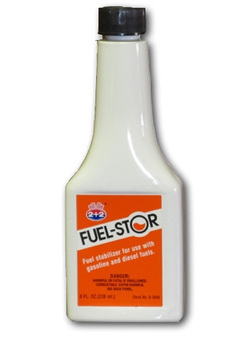 BERKEBILE 2+2® FUEL-STOR... will improve the quality of gasoline and base diesel fuel by providing: fuel stability during storage; dispersancy for insoluble gum which can occur during fuel storage; and corrosion for fuel system components. One bottle treats up to 20 gallons of fuel. Dispense entire content of bottle into fuel tanks and run engine for approximately one minute to desperse product throughout fuel system.